This bag sampling method requires a Teflon or stainless steel pathway for integrated sampling into a Tedlar bag. 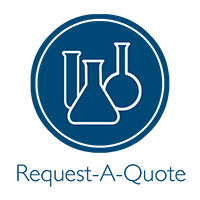 The bag sampling systems we offer are manufactured by Environmental Supply, and are offered in 10, 15, 20 and 30 Liter sizes. The intrinsically safe vessel can be evaculated to 30" Hg vacuum prior to sampling and used in volatile areas where electrical equipment is prohibited. The system inflates the Tedlar bag with sample at a constant rate through the inert sample pathway by applying vacuum to the leak-free vessel that surrounds the Tedlar bag. The ideal bag connection for Method 18 is a double end shutoff quick connect stem, male adapter and Teflon nut that connects directly to a femail stainless steel quick connect and 3-way valve assembly in the center of the vessel cover. 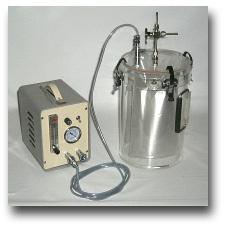 The 3-way valve allows the probe to be purged before inflating the bag with sample. An additional female quick connect in the cover connects to a vacuum line that runs to either the pressure port of the pump for evacuating the Tedlar bag before sampling, or the vacuum port of the pump for evacuating the vessel during sampling. The integrated sample is analyzed for total gaseous organics by gas chromatography.